Have you realised that the KanjiW fonts of this season are different from those used in the past? This is because the Kanji used for “Sake”, meaning ‘salmon’, not the rice wine though the pronunciation is rather alike with different accent, is the old one that we don’t use anymore and we had to use the font that includes such old Kanjis! So, this season is focused on salmon. Let’s read on the phrase after the word ‘Sake’. The word is followed by ‘no sakana’ meaning ‘of fish’ which is explaining what ‘Sake’ is. We have no idea why they had to mention that the salmon is a ‘fish’ here since salmon is quite a familiar fish in Japan. Maybe they put this extra explanation to match the rhythm of whole phrase, something similar to ‘rhyming in English poetry. The last word ‘muragaru’ is a verb, meaning ‘to swarm’ or ‘to cluster’. Therefore, the whole phrase says, ‘Salmons climbing up the streams of the river, clustering’. 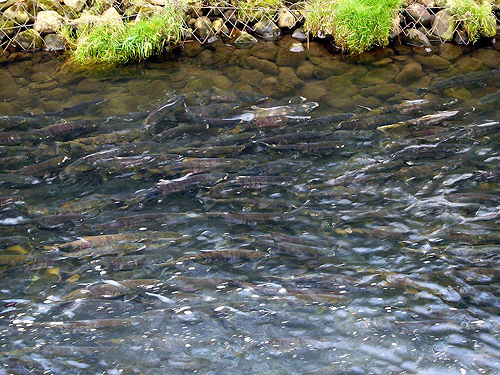 A scene of a river with many salmons clustered, trying to spawn in the river where they were once born, which is a scene you can see only in this time of the year in some places of Japan. Salmons clustering. Ayoro River, Shiraoi District, Hokkaido. Photo from ‘Wakuwaku-kobo, muroran’. We don’t see salmons in the rivers of Tokyo but you could see salmons coming up the river to spawn the most in HokkaidoW and Tohoku regionW even in the center of the town. You could also see salmons coming up the rivers in Pacific coastal prefectures with Tone RiverW in the southern limit and in FukuokaW, again the southern limit on the Sea of Japan coast side. Salmons have been one of the major fishery objects since prehistoric age in Japan. The record of the fishing amount is written in EngishikiW, a book on laws and customs of Heian periodW which was offered to the Royal Court in Kyoto. It was in 18th Century that one of the low-class Samurai in Echigo ProvinceW (now, Niigata PrefectureW) built a method of natural increase of salmon in artificial rivers which saved the financial problem of the province due to bad harvest of the rice. In 19th Century, it was followed by the professional artificial incubation at Chikuma RiverW. The cooking methods of salmons in Japan are similar to those of the Western countries, stewed, grilled, fried, smoked and canned but among those is the method of preserving with salt and straw called ‘Aramaki’. 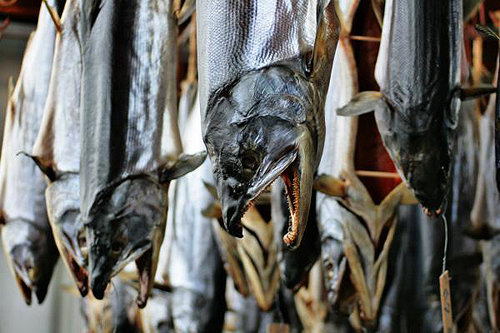 Salt-preserved salmons, ‘Shio-biki-jake’, being dried. Photo from Echigo Murakami Uoya Official Site. ‘Aramaki’ or ‘Aramaki-jake’ is a salmon preserved in salt and wrapped in straws lined like a mat or rolled on straw ropes. The origin of Aramaki seems to be salted salmons, ‘Shio-biki-jake’, which were wrapped in straw mats or rolled up in straw ropes for transportation. It is said that the word ‘Ara-maki’ was first ‘Wara-maki’ which means rolled up straws, which the condition of pronunciation changed while using them. Very rare sight now. 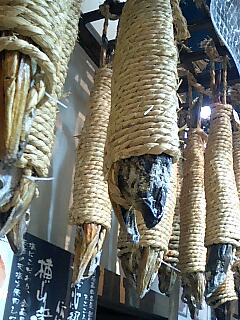 ‘Aramaki’, salt-dried salmons with straw ropes rolled on which used to be for transportation. 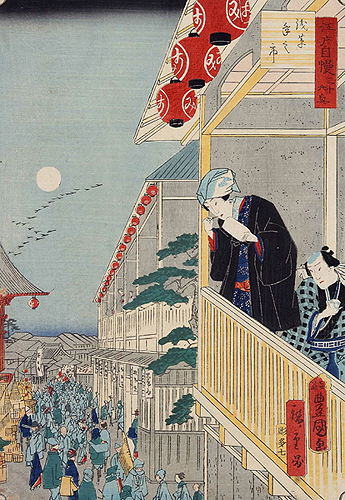 Photo from ‘Otona-no-mono, koto,kokoro’. 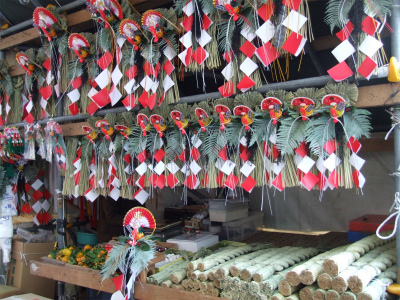 Aramaki is used to be one of the popular ‘Seibo’ – One of the annual functions in Japan. Giving courtesy calls on people from whom receive favour within the year with sometimes gifts. Now the word ‘Seibo’ is usually used on generic name to gifts given in means of thanks at this time of the year. Aramaki is still one of the delicacy of New Year in some parts of Japan. In the old days, there used to be stall markets open once every period selling goods that were related to the season. The market was open usually in one of the major Shrines or Temples of the districts. 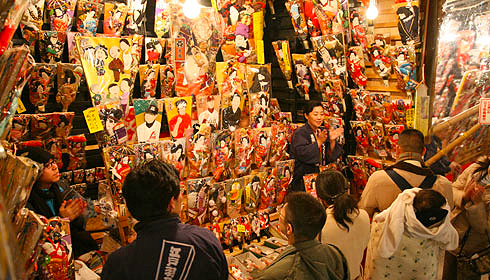 The last market of the year was called ‘Toshi-no-ichi’, selling decorations for the New Year, sundries, clothing and dried or preserved marine products. Because the last market of the year sold New Year celebration goods mainly, the market also have names as ‘Kure-ichi (meaning last market)’, ‘Kisetsu-ichi (meaning Season market)’ and ‘Tsume-ichi (meaning ending market)’. ‘Hagoita-ichi’, hagoita market held at Sensoji, Asakusa, Tokyo. Photo from Sensoji Official Site. One of the famous Year-end market today around Tokyo is ‘HagoitaW-ichi’ held at Senso-jiW, world famous temple in AsakusaW. The Hagoitas sold in this market are for decoration, not for doing actual HanetsukiW, a Japanese traditional game on New Year holidays like badminton. We have been taught that this game is played on New Year but have never played in our life! Still, the image of Hanetsuki is definitely one of those of the New Year and not other period of the year. Stall selling New Year decoration for house entrance, ‘Shime-kazari’. Photo from Ningyosho Shopping Street Official Site. There are some interesting and mysterious meanings set onto the year-end market in some places. In Sannohe District, AomoriW, there is a folklore saying that someones who look like your parents appear in the year-end market. There is also a legend in Kitaazumi District, NaganoW that the mountain witch visits the market. ‘Toshi-no-ichi’ of Asakusa in Edo period. Picture from Tokyo Metropolitan Library.